(ii) 'N', who is third to the left of 'P', is not a neighbour of 'R' and 'M'. (iii) S is the neighbour of 'O' and 'R' and is third to the right of 'M’. (iv) ‘L' is not the neighbour of ‘O', who is second to the left of 'N'. 1). What is the position of ‘Q'? 2). Which of the following is the pair of adjacent persons? 3). Which of the following pairs has the first person sitting second to the left of the second person? 4). If N and O interchange their positions, then which of the following will be the correct statement? a) S is on the immediate right of N.
b) R is second to the right of O.
c) O is between L and Q.
d) N is between L and Q. 5). Which of the following has the second person sitting between the remaining two? 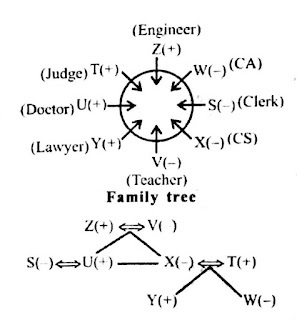 S, T, U, V, W, X, Y and Z are eight family members. Four of them are females and four are males. There are three couples, two daughters and two sons in the family. They all have a different profession, viz Engineer, Teacher, Lawyer, Judge, Clerk, Doctor, CS and CA. All are sitting in a circle facing the centre. Z is father of X and U. The CS is married to the Judge. Neither Z nor Y is a Judge. V is the Teacher and is sitting between the Lawyer and the CS. No male is a Teacher. T is father of Y and is sitting between two males. W is daughter of X, who is sitting second to the right of her son. S is the Clerk and is married to the Doctor, who sits opposite her. W is the CA and is sitting second to the left of her father. Z and Y are not adjacent to each other. All females sit together. 6). Which of the following pairs is not correctly matched? 7). Who among the following sits second to the left of Z? 8). Who among the following is a Lawyer? 9). Who among the following is an Engineer? 10). Who among the following is the wife of U?